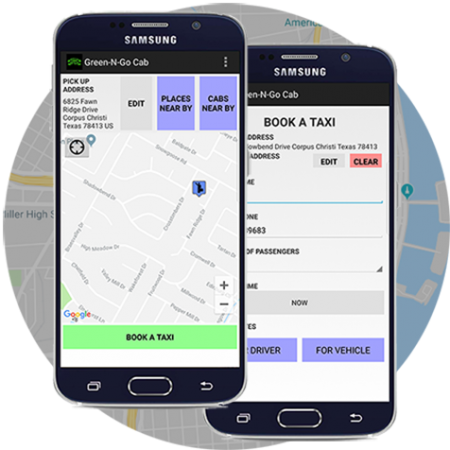 Green N Go Cab Company, LLC., is a local taxi service whose mission is to provide reliable, timely, and safe ground transportation services. We are committed to quality service and professionalism. Our vehicles are equipped with in car credit and debit card access, along with a state-of-the-art computer assisted dispatch system. Green N Go’s services demonstrate that we are innovative, forward thinking company that recognizes the need to move with ever-changing customer needs. Our philosophy is one that emphasizes service, and a realization that effective communication is a key component in our business. A locally owned and operated taxi service, we provide service 24/7. Call (361) 299-9999 now for immediate pickup! Our drivers have passed criminal background checks, carry up to date commercial insurance, and have daily vehicle inspections to insure the safety of every customer. We are committed to the special needs of our customers by providing full wheelchair accessible services. Does your company need reliable transportation to meetings, events or company parties? Green N Go Cabs can help. Call (361) 299-9999 for more information. We provide taxi service to and from the Corpus Christi International Airport. © Green N Go Cab Company, LLC. All Rights Reserved.